Machen Sie sich auf diesem Tagesausflug von Paris nach Honfleur und Cote Fleurie an die Küste der Normandie. 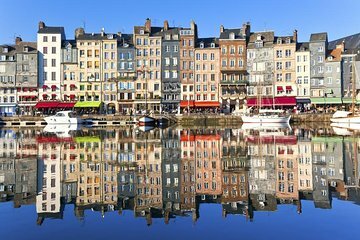 Erkunden Sie die kopfsteingepflasterten Straßen und das historische Dorf von Honfleur, genießen Sie die charmante Atmosphäre und fahren Sie weiter zu den Küstenorten Trouville und Deauville. Dies ist eine großartige Möglichkeit, um mehr von Frankreich zu sehen, wenn Sie in Paris nur eine kurze Zeit haben und nur einen Tag haben. Wonderful tour company....booked a tour with them to Honfleur thru' viator.com....I was the only participant on that day but they went ahead with the tour (tour companies in France and Italy usually cancel the tours if a minimal number of participants is not met - I got it twice in Italy last year). Sarah was most knowledgeable and most professional...It is difficult to come by travel companies with so much enthusiasm and honesty nowadays...this one will go very far. Thank you so much once again for showing me another beautiful part of France!